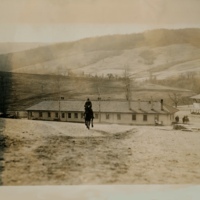 The collection consists of 106 black and white photographs taken during winter of 1941 at the United States Army Remount Station in Front Royal, Virginia (operated by the Quartermaster Corps). 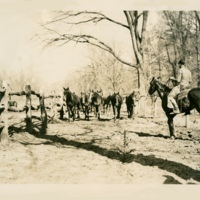 The photographs are captioned and illustrate the process by which the Army cared for and trained animals toward the end of the era of the United States Army Remount Service. Please note that full-text search is only available for items which have successfully had their text extracted. 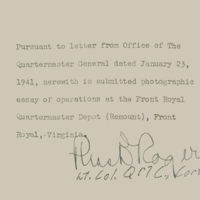 Due to the nature of the materials, many documents are not OCR-compatible. Description: Purchasing Horses. 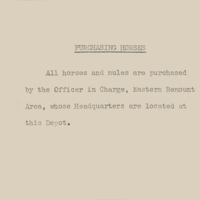 All horses and mules are purchased by the Officer in Charge, Easter Remount Area, whose Headquarters are located at this Depot. 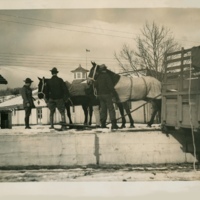 Description: Soldiers immediately take charge of horses brought to the Depot to be sold. 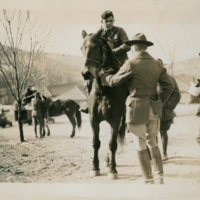 Description: The new horse is taken at once to the scales and weighed. 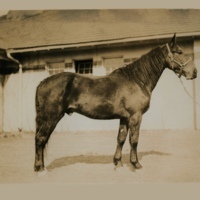 Description: The horse is next measured for height. Description: Determining the age by inspection of teeth. 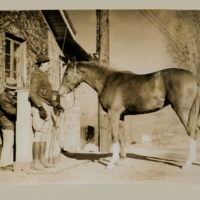 Description: Winding the horse. 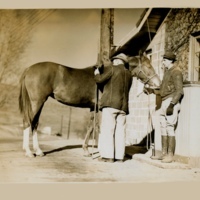 This is done by violently exercising the horse to determine the condition of his laryngeal membranes. 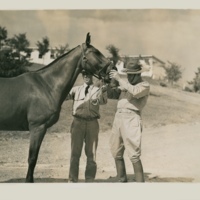 Description: A Veterinarian listens carefully to the horse's respiratory movements immediately following the violent exercise. Description: Newly purchased horse. 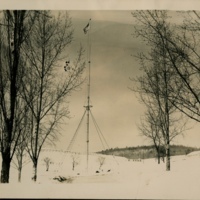 …Sound. 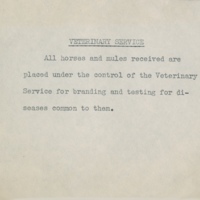 Description: All horses and mules received are placed under the control of the Veterinary Service for branding and testing for diseases common to them. 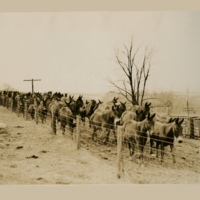 Description: After being checked to determine of they are in condition to go over the trail by a Veterinary Officer the animals are then started over the trail for the Quarantine Area under supervision of the wrangling gang. 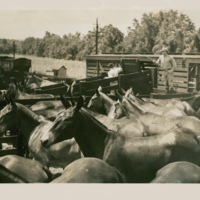 Description: Animals being received at the Norfolk and Western Railroad receiving corrals. 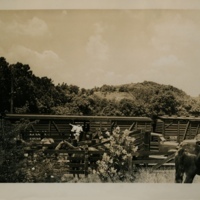 Description: Animals being herded by wrangling gang from railroad station to Quarantine Area.